These printable CD covers are PERFECT to create your own custom party favor CDs! 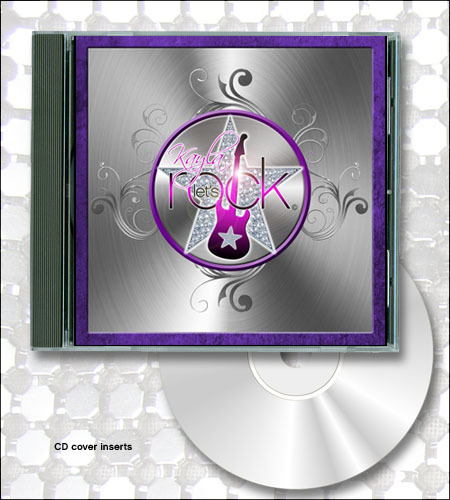 These are printable cd covers that you will print, cut and slip inside your own slimline cd jewel cases. Blank CDs and Slimline CD jewel cases are available at Staples. DIY CD Covers DO NOT include any printed items, cds or cd jewel cases. You will receive a digital file of your cd cover personalized with your guest's of honor's name that you will print yourself at a local photo print shop like Staples or Kinkos. You may print as many as you need. If you would like each CD personalized with each of your guests' names, contact us for a quote. For ideas on how to use your printables, click here to check out our "Let's ROCK!" party photos for lots of inspiration!